iPad Innovation: Diminishing Returns, Or Exceeding Expectations? Are you having fun yet? We’re in the process of winding down from another Apple Event Day, which means recovering from a day full of iFanpeoples eagerly clicking on every iPad-related article on the Web, a day in which blogs lap up the ad revenue, and trolls eagerly proclaim their indifference to whatever this iHubbub is all about, sneering at the army of iClones marching in lock-step to the nearest Apple Store. Let this wash over you, as it’s clearly a unique display that only the tech industry — and, really Apple — is capable of inspiring. In a tweet earlier today, Box Founder and CEO Aaron Levie tweeted an initial reaction to Apple’s iPad announcement that likely resonated with many: “It would appear that iPad innovation is experiencing the law of diminishing returns.” This strikes at the heart of the matter: Innovation. Because, when it comes to returns from sales, Apple devices (the iPad, specifically) are far from seeing anything that resembles diminishing returns. Apple sold 315 million iOS devices in 2011, 62 million in Q4 2011, and the CEO revealed that the company “sold more iPads in the fourth quarter of last year, than any PC maker sold of their PCs.” Yep, 15.4 million iPads were sold in Q4 2011, and iOS devices accounted for 76 percent of Apple’s revenue in the fourth quarter. However, with some saying that the iPad 3 is just a large version of the iPhone 4S, it’s worth asking whether or not the public will view this new device as an example of incremental innovation, or whether this is indeed a huge update befitting of media slobbering and hype. Apple has had every superlative known to man attached to it in the last three months, and when you pass Exxon-Mobil in market cap, there’s at least some justification for that. But, as the New York Times’ James Stewart points out, the company could be soon subjected to the law of large numbers, which basically means that it will be unlikely to sustain this kind of growth forever. Of course, that could mean that Apple continues its meteoric growth until 2015, when things start to level out. With the current adoption of the iPad, and many analysts expecting the company to sell 60 million iPads in 2012, it’s unlikely that growth slows in the near future. The market in Asia, and really the international market as a whole, is relatively new territory for Apple. Smartphone adoption in Asia especially is blowing the roof off, and if Apple can capitalize (like it’s already started to), the company’s already ridiculous numbers are only going to become more jaw-dropping. But the fact of the matter is, with each of these successive “Oh my God we’ve done it again” announcements, the public becomes increasingly inured to the actual magnitude of their hardware and software updates. So, we see the line between actual innovation vs. incremental updates become increasingly muddied. Yes, Apple is trying to play a part in reinventing education (via text books), though I personally would say they’re not really that close on that one, it’s doing its best to disrupt TV, and no doubt we will be seeing more. Yes, the company essentially created a new form factor with the iPad, but, again, it seems we’re getting to a point where Apple is going to have to introduce the flying car, a Watson in human form that can do my taxes, or an edible tablet before we’ll feel emotionally moved enough to pay attention. Of course, there’s a gulf between the tech media and the rest of America, and things aren’t quite as jaded on Main Street. As long as Apple continues to design its products (make updates) in such a way that really matters to its customers, then there won’t be a problem. Apple executives seem convinced that the new, new iPad — at least in terms of hardware — is a serious next-gen update compared with the iPad 2. And they do have a point when you consider the A5X chip, hi-res (retina) screen, and fancy new 5MP shooter capable of recording video in 1080p. Now, considering the fact that photo-snapping with an iPad has been a fairly fuzzy experience, this is a great update — for the iPad. 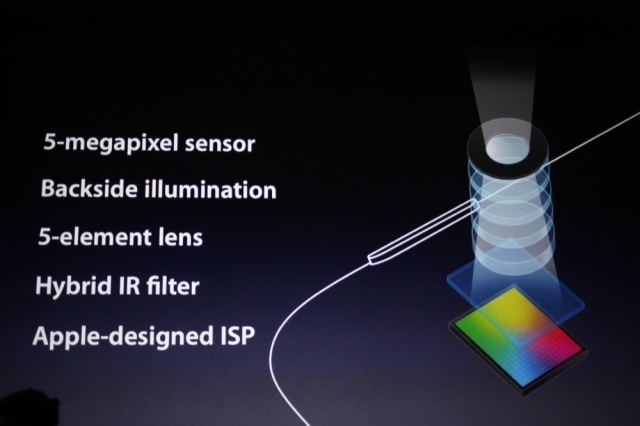 Yet, it still just sounds an awful lot like the camera on your iPhone 4S. But, with its new chip, which is supposed to be four times more powerful than Nvidia’s Tegra 3 chip, plus LTE or 4G speeds, voice dictation, a iPhone 4S camera, and a supposed 10 hours of battery life (hopefully unlike the iPhone 4S’ conception of “longer battery life”) — there’s plenty going for this iPad. After all, the iPad’s 2,048 x 1,536-pixel, retina screen is now of a higher-resolution than you’re likely to find on any phone, tablet, or TV, so, when we talk about innovation, it’s hard not to get a little excited about the effect this new gadget can have not only on video, but more so on gaming. As we wrote Monday, iOS is already killing Android in terms of its ability to handle HTML5 game performance, with the iPad 2 reigning supreme. And now, re-imagining games in extra HD is going to be amazing for games that, unlike Angry Birds, push the envelope in terms of animation and design. Of course, designing for that higher resolution can be expensive, and it remains to be seen whether the iPad’s new processor will be able to handle the higher resolution in graphics. There could be a huge boost as game developers figure out how to best incorporate cool new visual elements. What’s more, the iPad 3’s density and display likely will give it the best picture in your house, so you’re going to want to play your games on it like you would a regular console. Startups like Joypad, Flypad, and Brass Monkey are turning your smartphones into game controllers. I have a feeling the public is going to want more of these when/if they turn to using their iPad 2Ses as their main source of movie-watching and game-playing. All in all, it seems like there are a lot of subtle (and not-so-subtle) updates and upgrades going on with the new iPad (also pretty cool that the company has optimized all its stock apps for the new screen like it did for the iPhone 4S), but I leave it up to you: Are we seeing diminishing returns in terms of iPad innovation, or did this blow your socks off?